The below artworks are the most important by Marie Laurencin - that both overview the major creative periods, and highlight the greatest achievements by the artist. Artwork description & Analysis: This self-portrait dates from Marie Laurencin's time at the Académie Humbert and illustrates both her growing understanding of nineteenth-century academic painting along with her intuitive use of color. Laurencin depicts herself in a white smock, looking directly at the viewer with a neutral expression, her hair tucked behind her face. The palette is dominated by browns, whites and pinks and Laurencin uses color to model her face, with pinks shaping the sides of the nose and the eyelids and browns and greys indicating shadows around her cheeks, which have an unnatural whiteness that hints at her future use of the color. Her lips, at the center of the canvas, are red and full. Laurencin painted self-portraits throughout her career and her interest in using and returning to herself as a subject ties closely to her interest in female independence and self-fashioning. Laurencin presents herself as an independent artist and as a modern woman; she wears the smock of a painter and adopts a serious expression and confident pose, meeting the gaze of the viewer. This self-portrait, like those Laurencin completed both previously and later in her career, can be viewed as contributions to a tradition of female portraiture that extended back to the eighteenth century, drawing from painters such as Elizabeth Vigée-Lebrun and patrons such as Madame de Pompadour who controlled their own representation as a means of grasping independence and agency within masculine artistic circles. Artwork description & Analysis: This painting shows Guillaume Apollinaire surrounded by a group of friends, including Laurencin herself. Apollinaire sits at the centre of the painting, gazing forward, his hands folded on his knee, with a dog beneath him that turns its head back toward the poet. Gertrude Stein, Fernande Olivier and an unknown woman with a lavish headdress appear to the left of Apollinaire while Pablo Picasso, Marguerite Gillot and Maurice Cremnitz are grouped to the right, behind a vase of flowers. Laurencin appears seated on the ground in a pale blue dress, her body and leg turned toward Apollinaire while her head turns toward the viewer. Apollinaire and His Friends is predominantly painted with earthy, subdued browns and greys, with Laurencin's blue dress and Apollinaire's blue tie serving both to connect the pair within the image and draw attention to their figures. Laurencin painted this group portrait as a gift and homage to Apollinaire, following Gertrude Stein's purchase of a smaller canvas with the same title, and it serves as a showcase of the couple's position within Parisian avant-garde circles and of the ways in which this group mythologized themselves. While the color scheme is suggestive of Picasso and Braque's influence, Laurencin's interest in softer shapes and classicism is evident; the faces of the figures are stylized, flat and rounded, without extensive modelling, while the arrangement of the group at the left follows that of the Three Graces, a popular theme in antiquity. Apollinaire installed this painting above his bed in his apartment on the Boulevard Saint-Germain, where it remained throughout his life and after his death was preserved by his family. 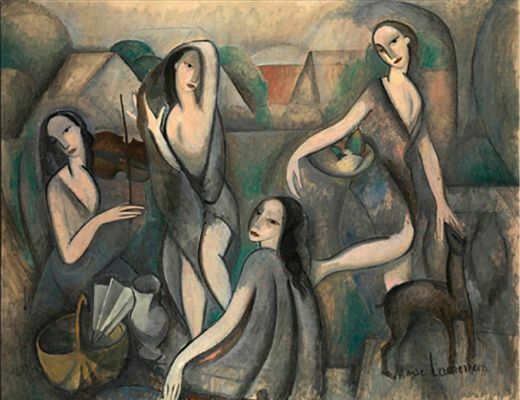 Artwork description & Analysis: The Young Girls shows four women, independent but overlapping, all with pale skin, dark eyes and dark hair, robed in grey and posing against an abstracted pastoral backdrop. On the left is a violinist, playing music for the figure beside her, who dances. At the centre, a seated woman, facing the dancer, turns to look back over her shoulder toward the viewer. On the right, another woman appears in motion, carrying a bowl of fruit under her right arm and reaching down with her left to stroke the nose of a doe. The limbs of the women are fluid, following the drape of their dresses, and their bodies are outlined with heavy black lines. The Young Girls is illustrative of Laurencin's skill in experimenting with different artistic styles whilst developing her own interests and visual language. The posing of the four women and their flat, mask-like faces are strongly suggestive of Picasso's Les Demoiselles d'Avignon (1907), while the flat planes of the village behind call to mind Braque's Houses at L'Estaque (1908). This painting, however, differentiates itself from these influences through the use of the four women to suggest a fertile sphere of feminine creativity, suggested both through the circle created by the figures' positioning and through the presence of the doe, a symbol of femininity and naturalness that Laurencin frequently employed. 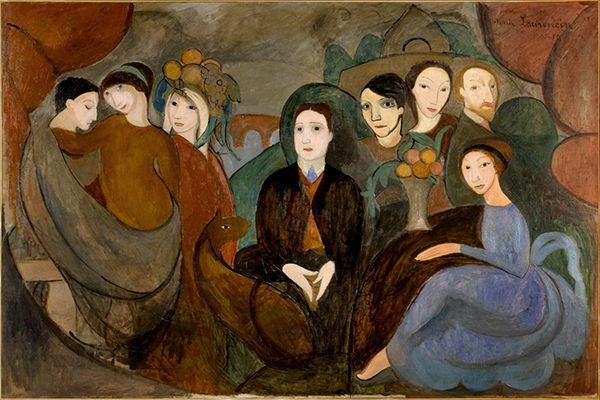 The performance, in which the women are both participants and observers, is reminiscent of those Laurencin regularly attended at the home of Natalie Barney and The Young Girls can be read as a contribution to this tradition of lesbian self-fashioning and as a celebration of an independent female realm. Artwork description & Analysis: This portrait shows Maire Laurencin and Cecilia de Madrazo, a collector and friend of the artist, with the head of a dog poking up between the pair. 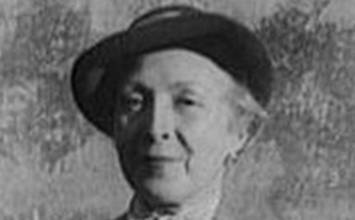 Marie Laurencin, on the left, is shown wearing a pink dress with short hair that conceals her ears and forehead; her cheeks and lips are pink, while her skin is grey, and her black eyes look down and out of the painting. On the right, Cecilia plays with the dog, looking down toward it and reaching a finger towards its extended snout. Her skin is almost white, with pink lips and cheeks, and she wears a grey dress and has a white hat, with large blue bow, atop her dark hair. The backdrop, rendered with little detail, is grey and there is a pink curtain at the right edge of the painting; the color scheme is very limited, with Laurencin utilising only grey, pink, blue and very small amounts of beige. This painting is emblematic of Laurencin's work, which has been both appreciated and criticised for its deliberately feminine aesthetic, with the painter prioritising pastel colors and soft edges. The figures appear peaceful and charming, in possession of conventional female virtues including beauty, taste and docility. Laurencin embraced the idea that women and her paintings could be decorative, but critical dismissal of 'decorative' and anti-intellectual art meant that male artists saw her work as embodying feminine weakness and early feminist critics felt her representation of womanhood played into such arguments. Laurencin's unashamed embrace of visual pleasure, however, and the development of an aesthetic that celebrated female softness, elegance and sweetness is itself a radical position. This painting, moreover, presents these qualities as part of a creative process in which the masculine is utterly unnecessary, with women presented as both artist and subject; Laurencin's focused downward glance, as if at a canvas, reminds the viewer of her profession. Artwork description & Analysis: The Fan features a pink shelf that holds two images of women, one in a rectangular frame and the other in a round frame, against a pink and grey background. The portrait to the left, in the larger, rectangular frame, shows a woman and a dog in greyscale accented by a pale blue ribbon, hat and curtains, while the round frame at the centre of the painting shows a woman presumed to be Marie Laurencin herself, though it is unclear if this is a portrait or a mirror. The lower right corner of the image is dominated by the folds of a fan, rendered in grey and white, that is cut off at the canvas's edge. The pastel hues and soft, apparently boneless figures are recognisably of Laurencin's mature style. The positioning of the fan in this image, as if held by a figure gazing at the frames on the shelf, implicates the viewer in a narrative that remains vague. The portraits on the shelf are arranged such that the figures within the frames appear to meet the viewer's gaze; the arrangement and display of such portraits suggests an intimacy between their subjects and the unseen figure holding the fan, in whose place the viewer is positioned. The Fan derives its emotional pull through this intrigue and ambiguity, raising questions as to the identity of both the subjects and owner of these portraits and their relationships. It has been suggested that the woman in the rectangular frame is Nicole Groult, a dressmaker with whom Laurencin likely had a romantic relationship. The display of portraits provokes - through the representation of figures presumed to be elsewhere - a sense of longing that can, given the context of exile in which it was created, read as a commentary on absence and longing. Artwork description & Analysis: Spanish Dancers shows three women, in blue, pink and white, dancing with a horse and dog against a grey and black backdrop with subdued hints of green. On the left, the woman in blue extends her leg and points her toe, her body extending the height of the canvas, with one hand holding the edge of her grey hat while the other reaches back toward the horse that is partially obscured by her body. The dancer on the right side of the canvas, in white, also strokes the horse's mane, while the dog at the centre of the image leaps up toward her hand. In the foreground, a woman in a pink, tutu-like dress with bent legs, who has been described as Laurencin herself, extends her hand toward the dancer in white and leans back, turning her face toward the viewer and directing her gaze toward the base of the canvas. The eyes of all three women are rendered simply, as thick black lines with dots at the centre, and there is little modelling or use of line to indicate the edges of faces, hair or fabrics, creating connection between the women and animals whilst contributing to the sense of fluid motion within the dance. Spanish Dancers sees Laurencin combining her signature color scheme with a more ambitious composition, likely influenced by her time in Spain, where she completed a number of sketches and smaller paintings on the same theme. Laurencin's style in this painting imbues the dance with particular characteristics. The softness of the figures and the limited color palette creates a sense of harmony, reinforced by the overlapping of the animals and women within the composition; the horse's large eye, close to that of the woman in blue, suggests gentleness and trust. Laurencin, as is typical across her oeuvre, does not develop the painting's setting, the shadowed backdrop contributing to the construction of a closed world in which dancers and animals are allied, content and self-sufficient. Spanish Dancers celebrates the ephemeral, with the soft edges of the figures and the undulating lines of limbs and fabrics suggestive of dance's fleeting nature, echoing and alluding to the impermanence of sensual pleasures. Artwork description & Analysis: This portrait of Coco Chanel is typical of Marie Laurencin's commissions, in which she often paired women with animals and dressed her sitters in colored scarves. Chanel is shown seated, her head slightly tilted and propped on her hand, with a pale poodle on her lap. It is unclear where Chanel's flesh ends and her dress begins; her pale outfit is accented with dark black and blue scarves, while the seat behind her is a textured pink and blue. She appears relaxed and her eyes and mouth, neutral and expressionless, suggest that she is daydreaming or preoccupied by her thoughts; the poodle's expression is similarly calm. On the right, in the background, is a dove descending toward Chanel and another dog, in the shadows, leaping toward it. Chanel commissioned this portrait in 1923, having become acquainted with Laurencin when both were designing costumes for Sergei Diaghilev. The painting, upon completion, was rejected by Chanel, who felt that Laurencin's woman did not bear enough of a likeness to her. This observation can be made of many of Laurencin's portraits; she did not deny it, but claimed that physical likeness was unimportant. Laurencin's portraits became simpler as she matured, with women stripped down to dreamlike figures that suggested a way of seeing the world in which emotion, rather than verifiable fact, was primary. 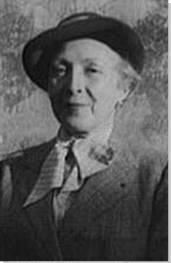 Laurencin's statements, often flippant and sometimes contradictory, provided playful explanations for her distinctive style; once, she claimed to base all women's faces on the face of her cat, while at other points she argued that she simply painted what she, extremely short-sighted and without glasses, saw. Despite Chanel's rejection of the painting, the success of Laurencin's approach was such that she continued to receive and execute portrait commissions in this style until World War II. First published on 29 Jan 2019. Updated and modified regularly.